I asked my wife, also, to help me with that. They showed us some catalogues. The prices were beyond what I wanted to pay. I made it clear that that just didn’t seem right to me. And I left it with my wife, I said, “help choose something”… I had so many other things to do at that point. I had no assistant secretaries, I had no deputy secretary, I was running from place to place dealing with a lot of important issues so I really wasn’t concerned about furniture. The next thing that I, quite frankly, heard about it, was that this $31,000 table had been bought. To be clear: Ben Carson, busy HUD secretary, sticks his wife, Candy, who apparently has nothing else to do, with buying the office furniture, then blames her for the pickle he is now in. CNN points out that this testimony is in direct opposition to the previous claim by HUD spokesman Raffi Williams that “Mrs. Carson and the secretary had no awareness that the table was being purchased.” Unfortunately for the Carsons, CNN says that emails proved that Carson and his wife were in communication about the furniture: “Emails show Carson and his wife selected the furniture themselves. 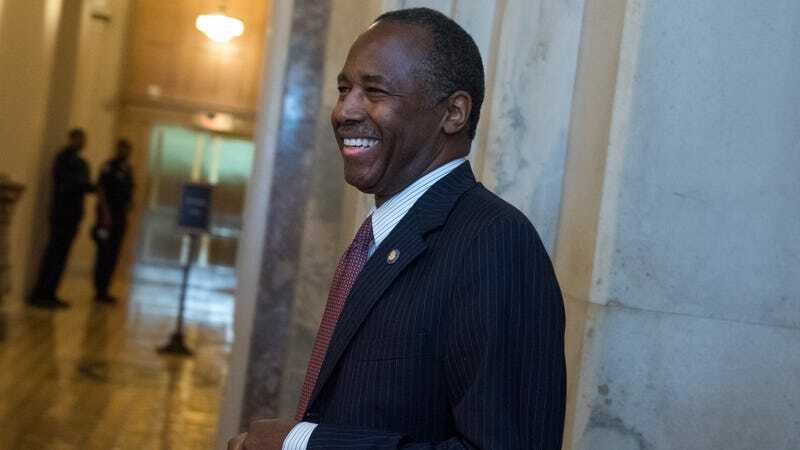 An August email from a career administration staffer, with the subject line ‘Secretary’s dining room set needed,’ to Carson’s assistant refers to ‘printouts of the furniture the Secretary and Mrs. Carson picked out.’” Details that Carson is now trying to distance himself from. We’re guessing that the next piece of furniture Carson picks out will be a pullout sofa for the doghouse he now likely has to move into.